I had leftover caramel from our caramel apples that were on our menu at the Living Local Festival. I bought pumpkins at morning glory farm. 2 for eating (Sugar Pumkins) and 1 for carving. Then there were the seeds, all entangled with strands of pumpkin meat. Have no fear, they are not hard to deal with. Like pomegranites, to separate the seeds, just put them in a big bowl of water, The seeds float to the top while the strands of pumpkin meet sink to the bottom. It makes separation of meat and seed much easier. Toss clean pumpkin seeds with olive oil and salt. They should taste salty. Some of this saltiness will reduce with roasting. Roast on a cookie sheet, check on them after twenty minutes (may take less time if the seeds were completely dry prior to roasting. I washed mine in water and ten coated them will oil so they had extra moisture to get rid of). Toss around to get even roast. Check on seeds at 4 minute intervals, tossing as they start to brown to get an even browning on all of them. The whole roast took a little less than thirty minutes. In the meantime, heat up your caramel so it is liquid and easy to pour. When seeds are done, line a bread pan with wax paper and coat with oil or butter. Pour seeds over the wax paper to create a nice seed blanket on the bottom. 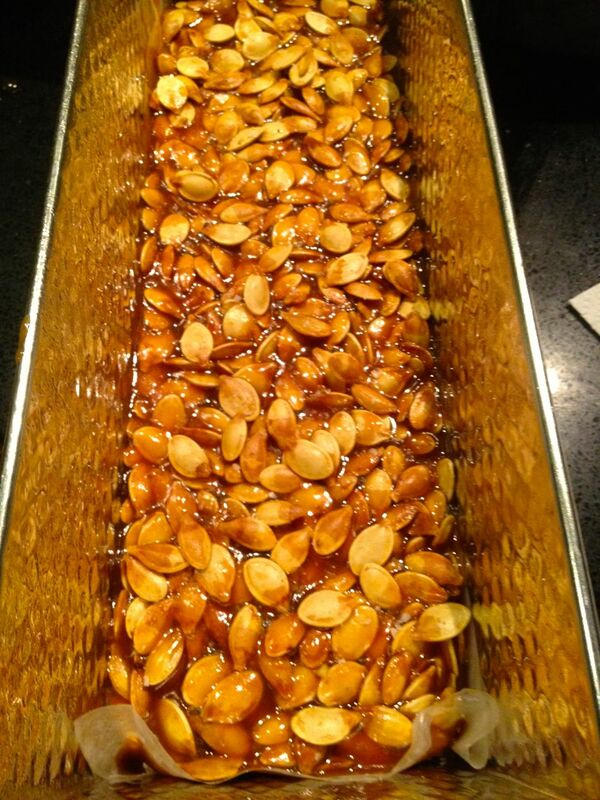 Pour caramel over the seeds and move the bread pan around to get an even caramel coating. 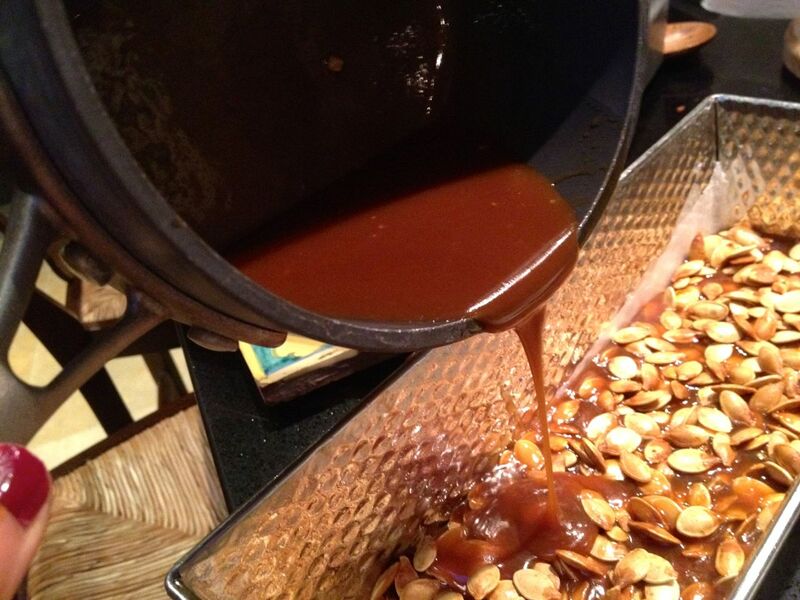 Repeat the process until all seeds and caramel are used up, and the caramel is evenly spread amongst the seeds. Note: This is not pumpkin seed brittle. Left at room temperature for a long time, the caramel will become melty. If you take it out from the freezer, you can cut slices and it will warm and get gooey with the touch of the hand. Serve on top of some ice-cream, everyone will love you! Love it! with…almond milk or regular milk, cinnamon, vanilla….what else?